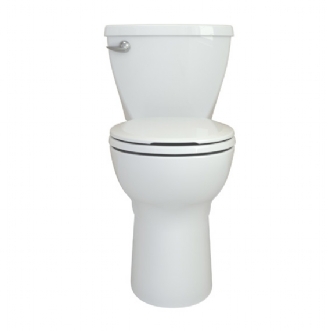 The American Standard Diplomat™ toilet delivers a reliable, powerful flush. It also features a PowerWash® rim that powerfully rinses the bowl with each flush. The porcelain is finished with a patented EverClean® glaze that keeps the toilet cleaner, longer. The EverClean™ Surface is super smooth and easier to keep clean, even after years of use; plus, the permanent EverClean antimicrobial surface inhibits the growth of stain and odor causing bacteria on the surface. This toilet also comes with a color-matched slow close seat. Color-matched Slow Close Seat is included and backed by a 1 year warranty.